Still known in her community of Grand Roy as “Teacher Jeannette” despite having retired as a public service, Ms Dubois began her “perpetual interest in learning, education and development” in 1967 at the Concord Government School. Between 1967 and 2000 she served in various teaching capacities including: Acting Principal, Concord Government School; Assistant Tutor/Coordinator of Administrative Affairs, National In service Teacher Education Programme (NISTEP): Supervisor of In Service trainees (NISTEP): Coordinator of OAS sponsored Curriculum Project; Tutor of Education Theory and Social Studies, Supervisor of In Service trainees, Grenada Teachers’ College; Head, Department of Teacher Education, Grenada National College; Dean, Division of Professional Studies and Head of Teacher Education Department, Grenada National College and Acting Principal, T.A. Marryshow Community College. Besides contributing directly to education, she also served in other areas which were indirectly relating to the development of students. These include: Coordinator of RBTT Young Leaders Programme from 2003 to 2013 and Coordinator of GRENLEC sponsored Inter Secondary Schools Debating Competition from 2008 to 2011. Ms Dubois who was awarded with the OBE title, received her primary school education at Concord Government School, and her secondary education at the St. Joseph’s Convent High School, St. George’s. In her pursuit for higher education she became a past student of the Grenada Teachers’ College; the International Training Institute, Sydney, Australia; the University of the West Indies, Mona Jamaica; and the University of Leeds. Her past Affiliations/Memberships ranged from trade unionism to serving as a member of the Public Service Commission. Some of these include serving on the Executive of the Grenada Union of Teachers in various capacities including President; 1st Vice President and 2nd Vice President; a Founding member of the Grenada Union of Teachers Credit Union and member of Supervisory and Credit Committees; a Member of Grand Roy Community Centre Committee; Deputy Chairman, Council of T.A. Marryshow Community College, and a Member of the Governing Board of the International Institute for Higher Education in Latin America and the Caribbean (IESALC) of UNESCO. 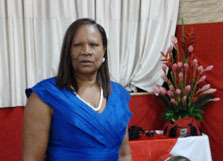 Presently she is an Honorary Member of the Grenada Union of Teachers, and a Member of St. John’s Library Committee. A dedicated Catholic, she is a member of the Building Committee of the Grand Roy R.C. Church; Member of the Pastoral Committee of the parish of Christ the King, and Secretary of the Liturgical Committee of the Grand Roy R.C. Church. The other honourees are Justice Monica Joseph with a CBE For service to the public and the law and will now be entitled the use the title Dame; Mrs Veda Gemma Bruno-Victor with BEM for services to sport and to the community; the MBE title was bestowed on Ms Cecelia Cruickshank for services to nursing and to the community, while the British Empire Medal was awarded to Thomas Alexis for services to the community; Terry Charles for services to the community and Ms Loraine Maxwell for services to mental health and to the community.